What is RIF of NOVA? RIF of NOVA, formally known as Reading is Fundamental of Northern Virginia, Inc., is a nonprofit organization designed to motivate children up to age 18 to read. Children served by RIF of NOVA programs are allowed to choose attractive, new paperback books keep for themselves. Margaret McNamara, a former teacher, started the program in Washington D.C. after she discovered that the young boys she tutored had never owned books. How does RIF of NOVA operate? RIF of NOVA programs distribute books at schools and centers in the City of Alexandria and Arlington, Fairfax and Prince William counties. 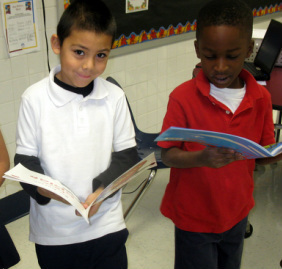 Each child served by a RIF of NOVA program chooses two books per year. Book distributions — run by teachers, parents and RIF of NOVA volunteers — are typically held in the school library and feature activities such as storytelling, drama, crafts and refreshments. How many children does RIF of NOVA serve? Who runs RIF of NOVA? RIF of NOVA is run by an all-volunteer Board of Directors. How long has RIF of NOVA been around? We were founded in 1972, by what is now the Junior League of Northern Virginia. We've been providing books to underserved children in Northern Virginia for more than 40 years! How does RIF of NOVA get its funding? RIF of NOVA's Board of Directors works diligently to raise money to cover the costs of books for distributions. We depend on a wide range of funding sources, including grants from charitable foundations, corporations, college and professional sororities, churches and donations from individuals like you. Since we no longer receive federal funds through national RIF, donations are more critical than ever before to RIF of NOVA's future. We're counting on you to help us continue to provide books to children who desperately need them. Make a donation to RIF of NOVA today!